Crowcon Detection Instruments, a world leading manufacturer and specialist provider of gas detection equipment, will present its next-generation high temperature H2S sensor and detection solutions at ADIPEC 2018, in Abu Dhabi. Ala Ayoub, Regional General Manager at Crowcon, explains, “We are delighted once again to be exhibiting at this prestigious event. ADIPEC is an excellent opportunity to network and make new business connections. Crowcon values its presence in the Middle East and has seen some important new business opportunities following previous attendances at the show. Crowcon offices in Dubai enable us to support our customers on a local level, resulting in us being able to meet and exceed our customers’ requirements. The Middle East oil and gas industry contends with high levels of H2S in their gas production operation. More recently, oil production is experiencing increased risks from H2S gas, as they extract more, heavier oils. Employees working in these extreme conditions need reliable, effective equipment to help minimise risk. To support the oil and gas industry in the Middle East, Crowcon has developed a high-temperature hydrogen sulphide (H2S) sensor to work alongside its XgardIQ fixed point detector and transmitter. These new sensors will be exhibited at the event. Crowcon is also introducing Xgard Bright, a new range of fixed point, addressable gas detectors with built-in OLED display. 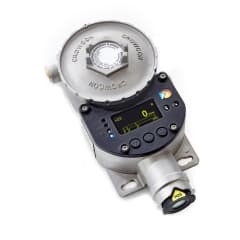 Other gas detection solutions being featured are the new Gas-Pro TK which has been designed for use in specialist inerted tank environments to monitor levels of flammable gases and oxygen. These and other gas detection solutions will be on the Crowcon stand, 8437 in the UK Pavilion, ADIPEC 2018 Abu Dhabi, from 12th to 15th November.